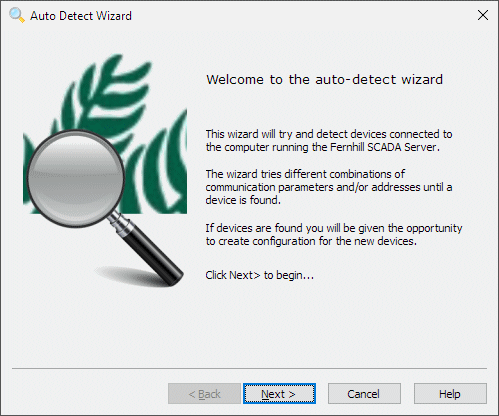 You can start the autodetect wizard from the Tag Window or the Start Page of the configuration tool. Allen Bradley DF1 Full Duplex Searches serial ports for Allen Bradley PLCs. Supports MicroLogix, SLC-500 and PLC-5. Allen Bradley DF1 Half Duplex Searches serial ports for Allen Bradley PLCs. Allen Bradley Ethernet Searches an Ethernet network for Allen Bradley PLCs. Supports MicroLogix, SLC-5/05 and PLC-5. Idec Micro Searches serial ports for Idec Micro PLCs. Supports Micro3, Micro3C, and MicroSmart PLCs. Modbus Serial Searches serial ports for PLCs supporting the Modbus protocol. Supports both RTU and ASCII variants. Modbus TCP Searches an Ethernet network for PLCs supporting the Modbus TCP protocol. Omron Serial Searches serial ports for Omron PLCs. Supports CS/CJ, CP1, CPM1, CPM2, CQM1, C200H, C2xH, C40H PLCs. Omron FINS/TCP Searches an Ethernet network for Omron PLCs. Supports CS/CJ and CP1 PLCs. Omron FINS/UDP Searches an Ethernet network for Omron PLCs. Siemens S7 MPI Serial Searches serial ports for Siemens MPI Adapters and PLCs. Supports S7-300 and S7-400 PLCs. Siemens S7-200 Serial Searches serial ports for Siemens S7-200 PLCs. Supports direct connection and connection via a PPI adapter. Siemens S7 Ethernet Searches an Ethernet network for Siemens PLCs. Supports LOGO!, S7-200, S7-300, S7-400, S7-1200 and S7-1500. For information about all drivers in Fernhill SCADA. For more information about the Fernhill SCADA configuration tool.